Other items needed are: Prayers and well wishes. I have an idea to help out member 2.5fierose a.k.a Tyler Shipman. Please reference the thread below for the story. Please P.M. me for the idea that I have and how you can help, as I would like Tyler to not know what I am doing. Thank you. Donations should be made to Synthesis's PayPal account: synssins@yahoo.com Please donate as a gift, and include your Username, and "Tyler Shipman" in the subject line. Please include "Tyler Shipman - Apparel" in the Subject Line, and include your name, shipping address, quantity and sizes, as well as any other data needed such as Black or White caps. Prices are below. Shipping is not included in the price, and should average around $5 bucks for 1-2 items. $8 for 2-6 and $12 for 6 or more (USPS Flat Rate pricing, subject to change) Please PM me with your info to get on either list. $200.00 Travel Expenses for members. $153.04 Fiero Store: K&N Air Filter, Ocelot D.O.T. approved Stainless Braided Brake Lines. New PCV valve (since it was cheap), new PCV/Breather grommets for the valve cover to replace old and damaged, new Left and Right power door lock switches, as we are installing Power Door Locks. $122.50 Amplifiers and associated accessories to install. The sound system is now complete. 30.00 Covered partial shipping of ground effects. 70 rental fee for finishing car. All money donated will be used for the vehicle and to assist with expenses associated with the project. All expenses will be itemized. Phone numbers and contact info for area businesses who are helping out, and for event organizers. If you are fine with your number being up here, please let Synthesis know. Our working location - Frazee Auto Body & Glass - 301 W Juniper Avenue, Frazee, MN 56544 (218) 334-6161 Karen and Dave... Call and say "Thank you"
Norseman Auto Detailing‎ 425 U.S. 10, Detroit Lakes, MN‎ - (218) 847-4415‎ Dennis is the man! Morningside Motel 31348 County Hwy 10, Frazee, MN 56544 218-334-5021 Robin is awesome! Transportation provided by Anderson's Bus Service 218-334-3171 Please call and mention that you are in town for Tyler from the Fiero Forum. Call in advance to arrange pickup from the airport in Fargo, and if you can consolidate so that 2+ people get picked up at the same time, it will simplify things for us and Anderson's. Fastback or notchie for the tail lights? I wish I had some GT parts, but I might be able to lend a hand repair it. It will be about a 3 to 4 hour drive. I'll talk to my twin (1984redsc) and see if he would be willing as well. I might have a set of barely used injectors from a Buick Century 3300 V6. I wonder if they will work. Any help you can give is excellent! I spoke to my wife today and we would like to fly out for a long weekend and help him once I get home, just have to see what our schedules are like. Also today, I am acquiring a parts car at my house, so I'll see what I can come up with once I get home and rip the car apart. Thank you to all that have responded to this thread and for the PM's. Let's show Tyler that we won't leave PFF family members behind! Yep and keep checking your PMs. I am available Nov 21st weekend. 2.5 You have a PM. I am currently working out getting a shipping address for anyone who is looking to send parts. I will let you know in this thread and via PM when I get an address to ship to. Thanks everybody, we're really rolling on this!! Maybe getting Tyler's mom home address ...that way all the parts will get there and you will be able to install them on location. Danyel, you have a PM. I have a set of dark gray/ light gray velour seats. They are in really good condition but they have some stains on the light gray seat part. If someone wants to send the tail light lenses, I think I can do a decent job of polishing them. I practiced on a really scratched up lens tonight and it came out pretty well. Ill see if I can pull a window next time I run to the yard. Ill just butcher up one of the notch clips to get it done faster. Hulki you have PM about a diffrent subject pertaning to this. An opportunity has presented itself to me in the form of round trip airfare for one member who would like to help Tyler but cannot afford the airfare to do it. This is on a first come first serve basis. Please PM me if you fit this category. Hey guys!!!!! wow I just read this topic you guys are really stepping up! I will talk to Tyler today and see where he thinks we should send the parts. We will have to work on the car either in Detroit Lakes (my friend's body shop) or at my house just a little out of town. I will definitly try to get some pictures of the car up by tomorrow and make a close list. As far as a build day or work day I saw the day of the 21st thrown out there. That would be absolutly awesome if we could get that going that soon, but we will need to make sure to have everything in line that day so we can really tear into it. Lets see what we get pulled together this week and decide. By the looks of it you guys are ready to make it happen. Someone asked about setting up a paypal donation system. I don't really know how to do that? I will look into it more today. I do have a paypal account, but I think I will probably make a new one just for Tyler. One thing that I see we overlooked is the Headliner in the car. I have recovered them in the past, but can't say I am a pro! Any tips tricks or ideas? I am going to see if the auto parts store in Detroit Lakes will donate a little. Once again thanks guys! Lets keep this ball rolling! Thanks for the response, Nick. I sent you a PM back regarding this. As for the headliner, it could be as simple as new foam and material, but we really need to find out what the headliner board condition is. I know Pep Boys sells a headliner refinishing kit if the board is okay. Kuwait??????????? That's right, you lucky SOB, you're going home!!!!! Have a safe trip, man!! Enjoy your time at home, and maybe will see you in Afghanistan. I talked to Tyler this morning and we are going to have the parts sent to my house. Someone will always be around (Tyler's family is really busy as you can imagine) and the car will most likely be at my house soon. Lets keep this going guys! I already had the turn signals shipped directly to his house. So please inform his family to be on the lookout for them. They went out Priority mail. Yeah that's no problem I will run over and pick them up when they come in Thank you for the turn signals!!! When bigger pieces come in they will most likely need to be signed for and the hospital Tyler is at is about 50 miles away from home. He might get to come home on Tuesday! I'm pretty sure Minneapolis is where they would be landing. They can only fly United with this deal, so it's anywhere that United has inbound and outbound flights to. Thanks, Dave! That helps immensely!!!! I have both right and left GT rocker's in grey with the steel mount bars. Tehy are in good shape - no breaks or cracks and look like they wll clean up nice. I can send them in the AM! One or both just let me know. I messed up - I do not have the rockers - I have the door trim pieces. I'll keep digging. o.k. I have a set of GT Rockers that I took off my car. They are in great shape except my car is a choptop. I think the inside of the door area part have been cut for the chop. I can send them if you think it will help or if it would be better than what he already has. They would need paint. If you want to see pics of them first just let me know. - I just fired off an email to Mr. Mike asking if he can help with a pair of seat covers for the car. - I was wondering how to set up a PayPal account, or some other way for donations to be made, as a way for forum members to make donations to help cover parts and supplies that no one has on hand. (Could be used to cover the cost of the paint mentioned in a previous post). I am ready to make a donation as soon as something is in place. - I have contacted the FieroStore to see if there is any assistance that they can provide. - I would like to contact some of the local news stations to see if the are interested in doing a Human Interest story on this. If anyone else coordinating something, please email me at JohnWPB -AT- Gmail dot com. This way we can tackle it together, and keep everyone updated. Ok, I contacted their local area newspaper with links to this page, his journal page, a variety of photo's from that page, info on the fund raiser on November 15th, and the info for the local bank that is taking donations under his name. I compiled all of this for them in the hopes of them doing a human interest story. When you find out if my gray seats will work for you, could someone donate the postage? I'm between jobs. If no one else wants to Id be more than willing to fly out there and help for this cause. I have a good headliner, its gray and has been recovered. The back of it isn't perfect. It doesn't sag at all, looks smooth and new, but has a small spray of glue on it, not noticeable in the car. I would gladly give it to him, but cannot afford to ship it, please PM me if this is needed, and maybe we can figure out a way to get it to him. I could head out there if noone else has jumped on it. any news on the rear glass? Well I want to see about what I can do about flying out there or greyhound to help out with this. $ is going to be the deciding factor in the end, time I have (unemployed) I also want to see about what I can do as far as getting all the parts he needs that iIcan get from a junk yard. I might be able to manage a rear window and a bunch of other things. My local yard has about 6 fieors in it right now that I can get parts for cheap out of. 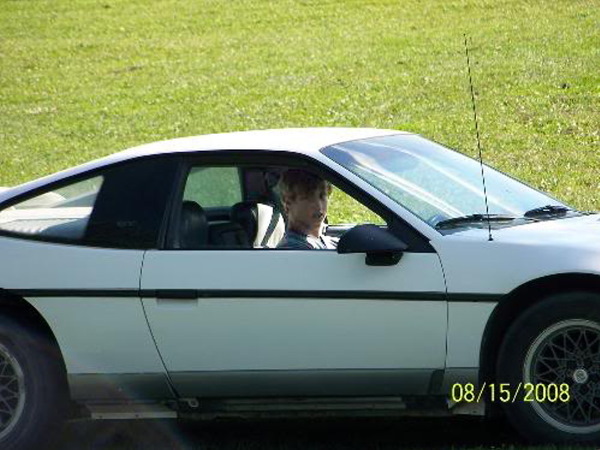 I think it would be a good learning experiance for me (not that I dont know what im doing) and would also be able to help another fiero enthusiest with his dream of getting his fiero back on the road. I Think thats the least he could ask in this situation. Again ill make the trip Ill stay a few days get a bunch of stuff done. Plus in the cold I go into my insomneac stage where I can stay up long hours. Well see what happens i have to see what kinda funds I can scrape together.